Born in Copenhagen in 1980, Christian Falsnaes currently resides in Berlin. His earliest projects weren’t exhibited in Copenhagen’s art galleries, but spray-painted on the walls and trains throughout the city. Falsnaes’ previous life as a street artist has been a driving force in his transition to performance art. Falsnaes explains, “Everything is planned beforehand, and that allows me to be present in the moment and react to the individual reactions of the visitors.” He finds satisfaction in teasing-out unsuspecting group’s inhibitions and in utilizing audiences as creative art material. 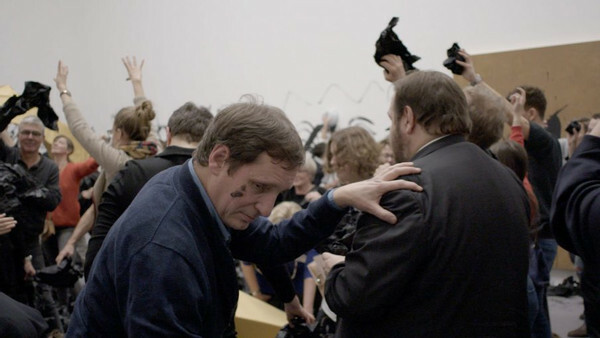 From the observer’s point of view, it can be both enthralling and intimidating to unexpectedly find oneself a participant in a Christian Falsnaes performance, however, the end goal of the manipulation in his work is not ideology, but art. “That’s very important for me. I also believe that this is why people willingly participate.” He adds, “it’s always about the reaction of the people,” and through this reaction, achieving a level of euphoria where inhibitions fade away.